ysabetwordsmith | Poem: "The Most Powerful Force Available"
Poem: "The Most Powerful Force Available"
This poem came out of the August 2015 crowdfunding Creative Jam. It was inspired by the "disability (temporary)" square in my 9-29-14 card for the origfic_bingo fest. It has been sponsored by EdorFaus. This poem belongs to the series Polychrome Heroics. Warning: Cash continues to deal with his new disabilities, which causes some angst, but for the most part he's making great progress. "The Most Powerful Force Available"
"It's good to see you again, Cash,"
on the goals you set earlier?" "Well, you were right about the massage,"
on my skin in a good way." "I'm happy to hear that," Graham said. "What about the other goals?" "The door trick helps, but it's boring,"
usually I don't bother with it." is a solution to your timer problem." by trees and flakes of artificial snow. Cash reached for it, then hesitated. "How fragile is that thing?" he asked. "It's pretty. I'd hate to break it." it's high-impact plastic," said Graham. "You can handle it safely." in his hands, stirring the snowflakes. "What's this on the back?" he said. "That's your control panel," Graham said. the lamp, if you want to use it as a nightlight. as a timer, anything from one minute to ten. Longer songs can be added if you want." Cash managed to sort through the menu. "This is -- this is great," he said hoarsely. "Thank you. It must have cost a lot." contributing their talent to a worthy cause." "Then thank them too, please," said Cash. things, that brings up the next item," Graham said. He brought out a pair of black fingerless gloves. "Those are grippy gloves; try them on." of some unfamiliar rubbery substance. but peeled away without leaving any residue. "These are amazing," Cash said with a grin. at least now he could hold onto something. "Where did you get the idea for these?" with mobility issues what they find useful." as the scars on his left wrist pulled tight. bugged him so he usually left it off. Maybe this would work better. "So what else did they suggest?" "The last item is actually a set,"
Graham said, laying out several items. spoon, fork, butter knife, and steak knife." trusting a supervillain with a sharp knife?" so it should aid your recovery." as he mimed scooping up something. The small achievement curled his lips. things like a pen or a toothbrush." slipping off of his face. won't need all the extra gear forever." than he wanted to admit. either, and that bothers me, too,"
he said, rubbing over the scars. "It's natural to mourn what you've lost,"
to help, if you'd like to talk about that." Cash grimaced. "Not really my thing,"
he said. "I just ... feel like ... less." available to humanity," Graham pointed out. "What?" Cash asked, looking askance. routines, he was so out of here. can use it constructively or destructively. to use them is entirely up to you." I was -- better with my hands." would you like to work on today? We have plenty of time." at his hands, turning the spoon over and over. "You can't stop thinking about the incident,"
after a traumatic experience like that." The shocks bitched up my aim." "I heard about that," Graham said. but I don't know how," Cash said. beside the snow globe. "I'm stuck." "You could begin with an apology,"
and help deal with the aftermath." really wants to talk with me,"
Cash said, his mouth twisting. is right, to restore the balance." Cash held up a shaking hand. activating the hospital communication system. "I need an electronic speech board, please." large enough to cover Cash's lap. other applications too," Graham said. labeled in English and Spanish. pointing to whatever they want to say,"
customized boards for other topics." He brought up one for Thanksgiving. who can't talk, but that's not my problem." "Why not just use a regular keyboard?" Cash said. "The rest just gets in the way." "It does that too," Graham said. to come out right. "This is hopeless." might help," Graham said gently. "It's meant to compensate for that." "Okay, get that one back," Cash said. the menu bar and look for Stroke Board." with an autocorrect to fix mistakes. and then groaned in defeat. putting his head in his hands. "Would you like me to check?" Graham said. "I might be able to help with that." "Go ahead." Cash passed him the board. the parts of an effective apology. with this? Email seems rude." I can drop it in the mail for you." sent the message for printing. "I'm not sure I can sign it," Cash said. "Turn over the board," Graham said. "It should have a signature frame attached." with slots that popped off the case. "How does this work?" Cash asked. of the slot makes it easier to write legibly." All of a sudden, Cash felt exhausted. "I'm really worn out," Cash confessed. "Can we call it quits for today?" pressing a button to call Dylan. "Emotional work is still work, Cash. or let that wait for later?" "I think I can finish that much,"
the door. "Dylan, I need a ride." over him to make sure that Cash was okay. frowning at him. "Any idea why?" "Emotional work is still work,"
"Ah, that'll do it," Dylan said. "Try to relax and get some rest." Cash had every intention of doing that. that Cash had completely forgotten. so that Cash could sign the page. to seeing you on Monday." was meant to be a wave. closing the door quietly behind him. seemed just a little lighter. its musicbox until he fell asleep. Men may avoid therapy because they expect it to be useless or even destructive. Those things can happen, especially if the therapy is poorly matched to the client's needs and personality. Cash has experienced more of the pointless kind than the harmful kind. When he notices signs that the therapy is working, however, he becomes much more invested in it. Because Graham was able to address some issues immediately and effectively, that convinced Cash that it was worth the effort. There are ways to encourage help-seeking behavior. Adaptive equipment helps people with everyday tasks and thus enables them to become more independent. What Halley and Edison come up with for a gizmotronic timer is a snow globe with pieces cannibalized from old clocks and aquarium fixtures. So now it has multicolor lights, swirling snow, and a selection of tunes that play from one to ten minutes as well as the digital timer display. Grip gloves make it easier to hold onto things. Here is an example of a stabilizing spoon, which you can also watch in this video. The fork and soup spoon attachments are now available. The gizmotronic version is better. An understanding of trust helps people discern who is trustworthy or not. Cash is a punch-clock villain with a sense of honor, so as long as he's not in the middle of a job, he's pretty safe. Acquiring a disability initiates a grieving process. Know how to support someone after a loss. Trauma can cause acute stress reaction, with such symptoms as intrusive and repetitive thoughts. This only becomes a disorder if it persists over time instead of healing and it interferes with everyday life. Understand how to cope with traumatic stress or help someone else through it. A communication board is one kind of adaptive equipment. This one is useful for health care. Here is the Thanksgiving one. 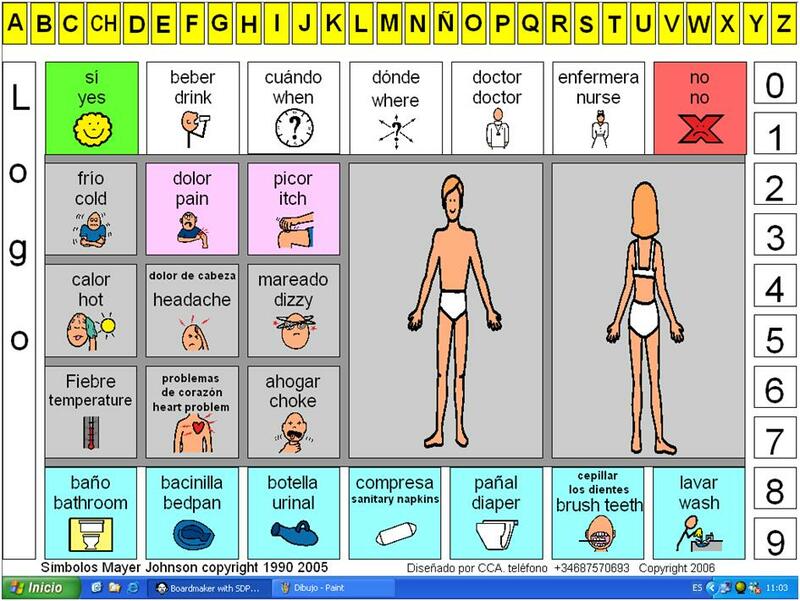 This computer program assists people who have difficulty speaking or typing. The keyboard screen has some extra buttons helpful for those situations too. Writing aids include signature guide clips and writing frames. The one stuck on the back of the speech board is a big frame with many different sizes and shapes of slots to use for different projects. Mental and emotional work can cause fatigue much the same way that physical work does. There are ways to cope with exhaustion. Graham really is an amazing guy. Absolutely. I'm very glad that dialecticdreamer lets me borrow him. Because some characters have a really awful history with therapy -- and bad therapy can do some spectacular damage -- I also want to show how a good therapist works to figure out a client's goals and help find solutions. Traditional "talk about your feelings" therapy isn't very helpful for Cash, but some other techniques are. Graham just pokes around until he finds them. Now if Ashley had had a therapist like that, she wouldn't be so much a mess... [even before the incident]. I think so too. She needs a new therapist, especially to help her cope with her new situation. Better than nothing, although she's not a very good match for Ashley in general. Now that would be fun to see. Especially if Ashley doodled it as a cartoon! The stabilizing spoon is cool! The fork and soup spoon attachments are available now: see All Products – Liftware. I have updated the links to show the new products. I greatly enjoy the stories where the 'bad guys' are treated like people instead of mobile punching bags. It's so easy to slip into the habit of dehumanizing antagonists, especially in action movies. Cash and Shiv, et. al. are people and are actually treated that way. Much better approach than the stigmatizing and putting them in prisons that essentially reduce them to livestock in a feedlot. Me too. I also like smart villains, which is not Cash' strongest suit, and honorable ones, which is. Too true. They are more interesting when more complex. That's part of what makes room for halfway-decent supervillains, instead of having them all be raving lunatics. I am frustrated by modern slavery, but must admit that it's done a sly job of convincing citizens that some human beings deserve to be livestock.